Located in the mature 85 acre woodlands of Northwood Park, minutes from Dublin Airport with our complimentary airport shuttle and a short distance to Dublin City Centre the award winning Crowne Plaza Dublin &reg Northwood provides the peaceful atmosphere for business and leisure guests to unwind, yet still have all the required business facilities at your fingertips Conveniently located minutes away from GAA ground Croke Park, as well as nearby Guinness Brewery, Trinity College and International Financial Services Centre (IFSC), Crowne Plaza Dublin &reg Northwood is the ideal location for all your accommodation needs without the busy city centre location. Our warm contemporary event space has the magnificent Redwood Suite for up to 1000 guests and an additional 22 meeting rooms many with wonderful views of Northwood Park. 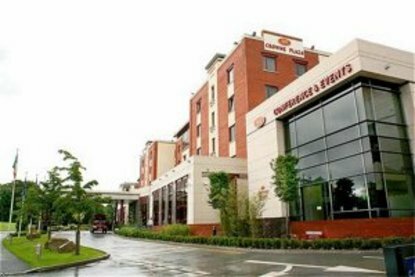 With a passionate team and an impeccable service culture we ensure that our guests enjoy a truly authentic yet unique experience at Crowne Plaza Dublin &reg Northwood. The design and decor of our 204 guestrooms and Suites is of the highest standard and guarantees you a relaxing stay. Air-conditioning, 24-hour room service, free in-room high speed internet access, pay movies and music on demand as well as wireless internet throughout are just a selection of what you can expect when you choose to spend a night with us.